Dirty Deeds sold right here. EDITOR’S NOTE: If you ask my mother, I tried to wreck her life between the end of grade school and when I graduated from high school, mostly because I cranked the AC/DC morning, noon and night. Still, in a decision that I admire today, she allowed my sister, Kim, and me to see an AC/DC show when I was in ninth grade—I think Kim and I were the only sober people in the building and, let me tell you, there was a lot of youth present, some far younger than I was. What they were on was anyone’s guess. I’m glad I was sober because I remember all that happened, starting with Angus Young stomping out on stage to hack away at a cracked liberty bell. Hells Bells rocked through the Seattle Coliseum. And then the band broke into For Those About to Rock. Cannons fired blanks from the stage and I felt those concussions roll right through my body. I don’t think Kim and I said a word for two hours because you couldn’t hear a thing. I came back from that show a bigger AC/DC junkie than ever. When I wasn’t running or playing basketball or football I would head to Kevin Whitinger’s house and listen to what I consider to be AC/DC’s best album, Highway To Hell. AC/DC was all about rebellion and Whitinger took that lead to a I high level. In ninth grade our basketball team shared the practice gym (Practice? Are we talking about practice?) with the varsity girls team. One time our head coach was standing at mid-court talking to the girls team. Whitinger walked up behind the coached, grabbed the dudes shorts, and yanked them down to his ankles. Our coach stood 6 feet 10 inches tall, so it took a while for him to get those shorts back up. I think he would have killed Whitinger if it were legal. 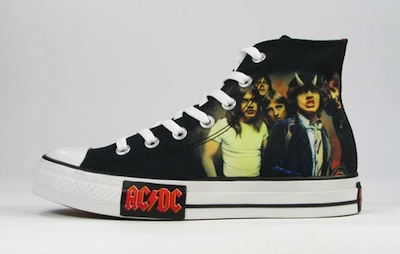 I still like listening to AC/DC and I like how they have penetrated corporate America because you hear their songs and little riffs in the advertisements of major corporations. I still think they were better with Bon Scott than Brian Johnson, but I listen to both leads. My growing-up nickname was “Dirty” (a play off the phonic connection in my last name with the song “Dirty Deeds Done Dirt Cheap”… part of the nickname also had to do with the fact that, as a high school/college water polo player, I had a reputation for less-than-gentlemanly game conduct, e.g. kicking opposing players in the nuts when the ref wasn’t looking). I once lit a New Jersey hotel room on fire while listening to “For Those About to Rock (We Salute You)” but, thankfully, was not prosecuted for that. I credit my own sexual awakening to the song, “Love at First Feel.” In that light, I believe what made AC/DC so incredible was the band’s willingness to throw blatant sexual suggestion in front of floor-to-ceiling stacks of Marshall amps in crowded arenas. I once owned a candy-apple red Gibson SG electric guitar; I had to sell it in college, but not until after I perfected the two-stomp (per leg) Angus Young method for keeping musical time. If ever I own a male dog, his name will be Angus. Notable shows (7 total): Mecca Arena, Milwaukee; The Spectrum, Philadelphia; Joe Louis Arena, Detroit… all in the early-mid 1980s. Bon Scott was the band’s best front man. Without question. Choking on your own vomit is, in fact, an acceptable way to go…… ask Jimi Hendrix. But what’s better is the hero legacy, afforded to the rest of us who roll our buddies or girlfriends over in the middle of the night, and can nobly claim to have saved their lives the next morning. This entry was posted in Road Tunes and tagged AC/DC, Kirk Deeter. Bookmark the permalink.